One of the main reasons I love where I work and what I do is that we help nonprofits; in fact, we specialize in it and have made it our company’s primary mission to provide thoughtful, honest advice combined with excellent quality work to help nonprofit organizations be successful. I truly cannot think of a more fulfilling calling than to assist organizations who are trying to change the world in a very real, altruistic way. And, even more impressive, they do it on shoe-string budgets, with minimal staff, limited resources and never enough time. I am awed by their passion, commitment and the love they have for those they are trying to help. However, as marketing and fundraising consultants, much of what we do is behind the scenes. Meaning, we work closely with nonprofit leadership teams, helping them determine how best to raise awareness of what they do and how to raise the money to do it. We consult with them, often privy to the inner workings of the organization, whether we’re writing a fundraising or marketing plan, developing content for their website, working with the media on their behalf or developing compelling materials that help them tell their stories. It’s wonderful work and there is no doubt we are assisting them in their missions. And until recently, I thought it was enough. 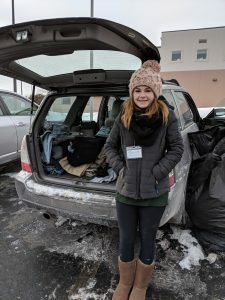 Shortly before the holidays, my 16-year-old daughter, Emma, and I volunteered to make blankets for the homeless with a group called Because I Said I Would, Akron. (We live in Akron, Ohio, so I try to focus our volunteer efforts in and around our own community.) The blankets were, in turn, to be donated to the Akron Snow Angels, who deliver much-needed supplies to the city’s homeless population during the cold winter months. It was a nice night. She and I made two, heavy-duty blankets with material that we donated ourselves (this was not a requirement). I was proud of our efforts and felt good about taking time to help make what looked like about 100 blankets to be distributed throughout the city. But then I started to think about who would get those blankets – where they would end up – and wondered if we couldn’t do more. The next day, I signed Emma and me up for an Akron Snow Angels mission. We would take our volunteering one step further by handing out blankets and other supplies and, most importantly, meeting those we were helping. Although we’ve volunteered for other organizations before, this was an experience neither of us will ever forget. It was Sunday, Jan. 7 and it was about 6 degrees outside. The weather was brutal. We visited Second Chance Village and Summit Park, located by Haven of Rest Ministries in Akron. Second Chance is a homeless village in Akron and Summit Park is frequented by many of Akron’s homeless. We met men and women, young and old. Our duty was to hand out pants – sweats, jeans, overalls…anything to add another layer. Everyone was pleasant, polite and grateful for all we were doing for them. And it broke my heart. At one point I was in tears. Whether it was the man who was beaten up on the bus or the woman with her teeny, tiny bedraggled dog or the teenage girl, same age as Emma, who got to me, I don’t know. I think that young lady got to Emma, too. “She’s so young, mom,” she said to me, as the girl walked away. But there was also laughter and hugs and hot coffee and lots and lots of thanks given. Since that day, I’ve been thinking about what more I can do to help – there’s always capacity for doing more, right? And I realized maybe it should start at work. 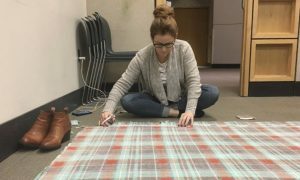 Like the blanket-making, our work is meaningful and helpful and valuable, but, again, it’s behind the scenes. Don’t get me wrong, sometimes what a nonprofit needs most is an outside perspective to help them determine where they are and what direction they should head. And we provide them that. But daily, our clients are fighting housing discrimination; serving homeless families; ensuring our kids get a quality education; advocating and educating on behalf of those they serve in an effort to create a better world…the list goes on. And we need to understand that side of their operation as well. So I resolve to do better this year – to make strides to get to know the people our clients are serving. We can serve them that much more effectively and help them in their missions to build better communities.